This display presents a group of women working as historians and art historians in the Victorian period. Works such as Lives of the Queens of England (1840-9) by Agnes and Elizabeth Strickland were created in response to public desire for a new type of history, one that was not solely concerned with politics and warfare. Described as 'picturesque' history, the work of these women focused on biography and narrative. Their research was original and revealed untold stories, particularly those of women. The women featured here were educated at home and, although denied access to formal education and university, were fortunate in receiving encouragement from their families. However, they were aware that their scholarly work was not wholly acceptable in Victorian society, and some of the historians underplayed their professional achievements. Agnes Strickland rejected the 'bluestocking' label originally given to intellectual women in the eighteenth century, protesting that she was 'not in the least blue', but was devoted to 'the needle and pen', showing that she was equally at home with the traditional female pursuit of needlework. Other writers in this display held more radical views. 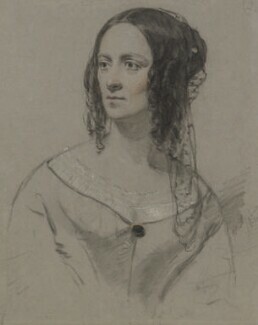 The pioneering art historian Anna Jameson, author of the five-volume series Sacred and Legendary Art (1848-64), developed a feminist tone and claimed that she wrote for women readers. Both Jameson and another art-historian, Emilia Dilke, campaigned for women's rights. Examples of the books produced by these women are also shown here.